I am at a much better place now since the last time I wrote here! 2018 has been so brutal to me but I have grown so much. I know it's not end of the year yet but hey it's September! 2018 went by hella fast! I thought I lost so much in 2018, however the fact is the opposite! Besides knowing abut how I should feel and deal with events, I actually pushed myself and forced myself to do what I know I should do but was afraid to do! The results are brilliant and I feel so much stronger! There are definitely sad days but I just keep telling myself that time will pass and if I keep trying, I will be feeling positive again. ALSO, IT"S COMPLETELY NORMAL TO FEEL MEH ABOUT LIFE! So give yourself a break and don't demand yourself to be happy and bubbly all the time! This is one of the most figure flattering dresses that I own! Get this dress from Revolve LPA HERE! This lovely eyelet top is from Marjorelle. Is Your Scalp & Hair As Young As You? To have a beautiful head of hair means you got to have a healthy scalp. Your scalp is the garden and your hair is the flowers! We often care about how our hair looks but not how well our scalp is doing. 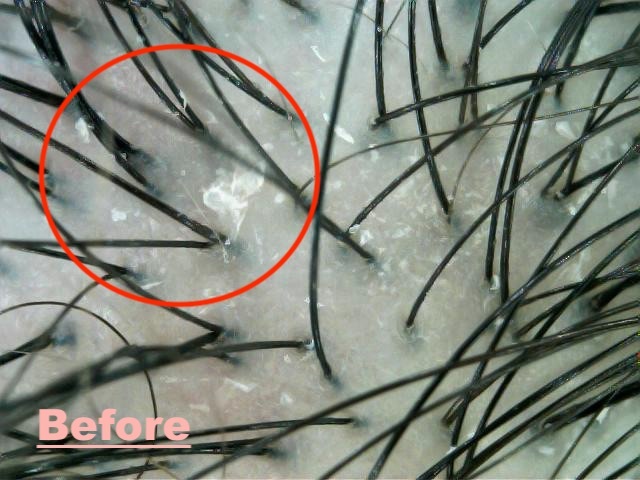 For all you know, our scalp might already be clogged or inflamed which will impedes hair growth. 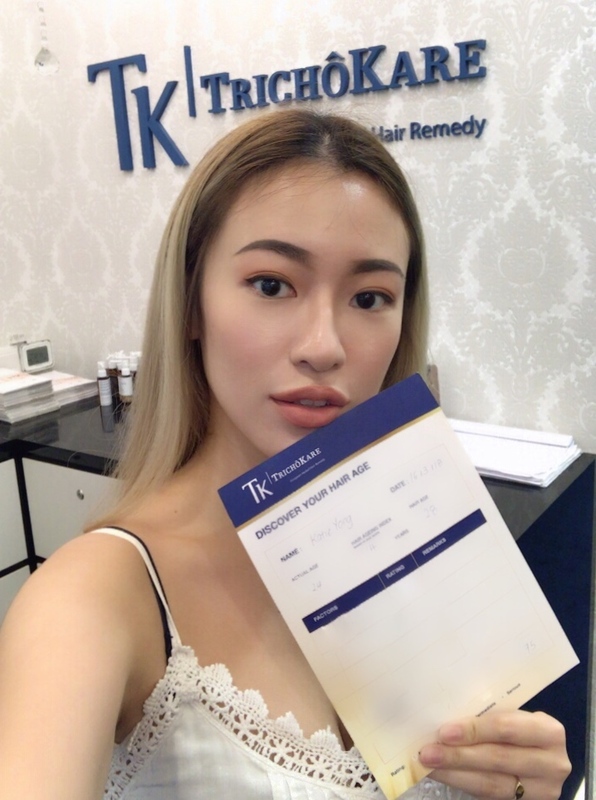 It was my pleasure to be invited to TK TrichoKare, the leading Trichological centre, to try out their Award-winning Hair Fall Prevention Treatment. At TrichoKare, your scalp and hair are in good hands of the Trichologist.Using advanced formula and revolutionary technology, TrichoKare’s treatments are all customised using premium European herbs validated by certified Trichologists, which have been proven to have medicinal benefits on the hair and scalp to promote hair growth. Elle Beauty - Best Treatment For Hair Loss, Parentsworld Beauty Awards – Most Effective Hair Loss Treatment, Daily Vanity – Top 10 Trusted Hair Treatment Centre 2017 and many more. That clearly proves how effective TrichoKare can be when it comes to preventing hair fall & hair loss, as well as promoting healthy hair growth. I was warmly greeted by the Trichologist as he proceeded to explain the ecosystem of the scalp and hair follicles. 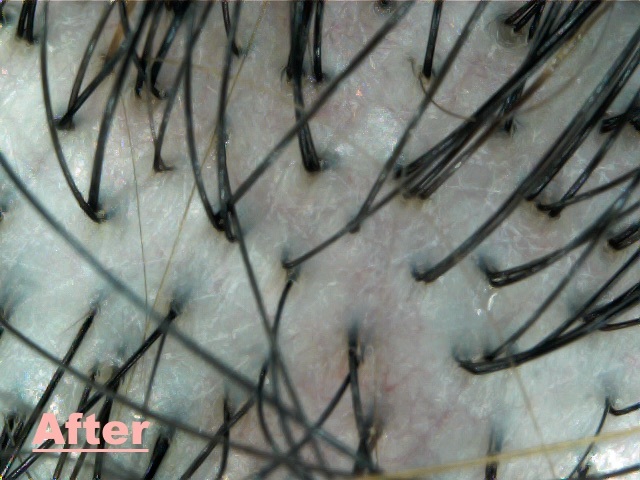 To my surprise, hair follicles are supposed to be enlarged unlike the pores on our face. Enlarged hair follicles will allow oxygen to reach the root of the hair more effectively. And the moment of truth came when my scalp was shown under the super zoomed-in lens. I got a shock of my life... My pores are all clogged up and flaky. According to the trichologist, my scalp is in ICU. All these clogged up pores can detriment hair growth and cause balding. HALPPPP! My scalp is naturally on the oilier side so there were obvious build-ups of sebum on my scalp. This results in an excessive hair loss, hair thinning and brittle hair strands, which is the reason why my hair has aged faster than it should. I was legit panicking and couldn't wait for treatment to start and get my scalp cleansed. The Award-winning Hair Fall Prevention Treatment is specially developed to help both men and women counteract age-related changes in the density and diameter of their hair. It helps to combat thinning hair/ hair loss or any scalp problems. The treatment regime will be customised by their haircare experts to your needs, to ensure that you get the most effective results. The treatment started off with a scalp masque which will help lift debris off my clogged scalp. It helps to deeply cleanse the hair by removing excess sebum and soothe the scalp to reduce the redness. This specially customised scalp masque was left on for 20 minutes. Felt a little minty and I could feel that it is working on my dire scalp. Once 20 minutes was up, it's time for hair wash! The hair wash took around 15 mins, I could feel the hair expert working diligently on every inch of my scalp. I don't think my head has ever been so thoroughly washed before. My hair was shampooed twice and the hair-wash consists of massage as well to promote blood flow to the hair follicles. Here comes one of the most exciting part of the treatment that I’ve been waiting for. TrichoKare uses Oxyjet to deliver oxygen and nutrients to the hair follicles. Pulses of cool oxygen combined with TrichoKare's hair tonic ampoule feels really refreshing on my scalp. It helps to encourage the production of collagen and accelerate cell regeneration, which in turn improves hair growth & control hair fall. The active ingredients are able to penetrate deeply into the scalp without needles, it is absolutely painless and gentle. I wish the process lasted longer because it felt really good! After blowing dry my hair, we went on to the last step of the treatment. It is meant to improve blood circulation on the scalp so the hair follicles can be better supplied with oxygen and nutrients! It helps to open up the pores and prevent the follicles from becoming dormant! This intensive regeneration encourages activity on the cellular level to promote hair growth and restore your hair to its former glory. Here is my Before and After pictures of my scalp. You can see how much cleaner my scalp was AFTER the 2hrs treatment. Y'all can see how the flaky bits are all gone. No more clogged pores! I’m so impressed by the expert Trichologists at TrichoKare. I love how the results are so immediate! It can really help to thicken your fine, thin hair! My scalp stayed squeaky clean and fresh throughout the day despite Singapore's Humid weather! It has been almost 2 weeks, my hair fall has reduced SO MUCH my goodness! The results are undeniably good and it was an eye-opening experience for me! Having seen results myself, I really encourage people with scalp problems or hair loss/hair thinning problem to give TrichoKare a go. Discover your Hair Age now when you sign up for the Award-winning Hair Fall Prevention Treatment at $40 NETT, including a FREE HairGRO Ampoule and Oxyjet with a total value of $758! Extra perks: Stand to WIN 2D1N Marina Bay Sands Staycation worth $780, after the trial treatment. Hi there, I am Katie! Drop me an email at katepurk@outlook.com!